Unless you consider yourself to be a “foodie” and a “wine geek”, you probably have no clue how or why you would want to consider pairing the proper wine with food. Even if you consider yourself to be both, knowing how to pair wine with food them can be a little intimidating. In fact some foods are much more difficult to pair with wine than others for a variety of reasons. Here we will break down some simple elements that can make wine pairings easy. Wine flavors have a many different components including fruit, acid, alcohol and tannins that make up their profile. Food is similar in that it has a multitude of components like fat, acid, salt and sugar that make up its profile. The best and most successful wine and food pairings feature complimentary components that work together and play off of each other. There are a few details to consider when properly trying to pair wine with food. Although it may seem clear cut (like you may have heard people say, “red wine with beef” or “white wine with chicken”), there are certain characteristics in foods that make them pair with better with certain types of wine or possibly not pair with wine at all. Here we will look at a few including texture, fat, acid, sweetness and salt. The texture element is a good place to start because it is relatively simple. 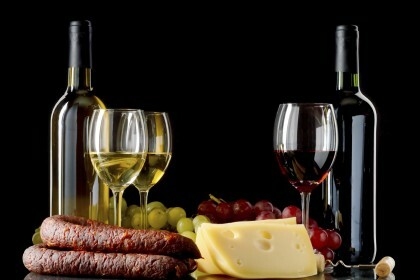 Think in terms of light foods are best with light wines and heavy foods pair best with heavy wines. Of course there is some room to debate what is light and what is heavy for both the food and wines. But in this case, practice can make perfect. The more you taste different foods and different wines, the easier it will become. An example would be to pair a Pinot Grigio with a shellfish dish for the light side and maybe a rich and juicy burger with a Syrah for the heavy side. Pinot Grigio can be a very light, fruity and clean wine and a Syrah is typically known for being a bigger, meatier and either a spicy or earthy wine depending on where it is grown. Unfortunately for many of us, a lot of our favorite foods contain high levels of fat. Not so good for your body but good for a food and wine paring. Since wine has no fat, it can benefit from and become more balanced from the fat from the food. The fat from food can temper the acidity of a wine. Also, the fat of a food can be soften the wine tannins (textural component in usually red wine that dries the mouth), making the wine more pleasant. The richness of a wine and food should balance as well. It can take a “big” wine to “stand up to” a rich savory meat dish. A perfect example of wine pairing based on the fat in a food is pairing a steak with a Cabernet. The protein and fat from the steak softens up the mouth drying tannins from the wine. Fruit and tobacco flavors from the Cabernet mesh with the smoky and meaty flavors of the steak. At the other extreme of fat is acid and it is present in both food and wine. With an acidic food dish make sure the wine’s perceived acidity is equal to the food otherwise the wine may taste dull and not taste as good with the food. This particular pairing can be one of the hardest to perfect and may take a lot of trial and error. As an example the acidity in salad dressing always makes for a tough match with wine. Something to consider is either making or ordering salad dressing with less lemon juice or vinegar and using bitter greens. In addition, herbal flavors which are characteristically in many Sauvignon Blancs, can offset some of the bitterness letting the acidity shine bright. This particular element seems simple enough on paper. If having dessert or some other sweet food, it seems intuitive to pair it with a sweet wine. But one needs to remember that there are different shades of sweetness. Light and fruity sweetness can be matched with a richer Chardonnay effectively, especially a wine that is higher in alcohol. Higher alcohol gives the impression of sweetness and that can balance out a fruit sauce that is not overly sweet. The basic rule with desserts is that the wine should taste sweeter than what you are eating. Although some wine drinkers love a dry red wine with a chocolate dessert, it may not match well if the dessert is significantly sweeter. The wine can scrape the sweetness from your palate leaving harsh tannins and leaving a sour note to the wine. A late bottled vintage Port can often do the trick. Salty foods like acidic foods can be one of the most difficult pairings of all. Salt can make many white wines taste “off”, mask the fruit in many red wines and turn higher alcohol wines bitter. Sparkling wines such as Champagne or Cava may be the best pairing with salty foods. The yeasty elements combined with the carbonation can clean the palate and add interesting textures and nuances. Pairing a dry Champagne with oysters can be a perfect pairing. The acidity from the wine wipes out the salt and brine from the oysters leaving a clean finish. Like matching acidic foods and wines, salty foods can also take some time to master. There are so many things to consider when pairing wine and food and there are so many different rules depending on whom you ask. Above all the most important thing that you can do is to experiment with as many combinations as you can and trust your own palate and have fun with it!